February 11, 2014 by Venky. What do you do on a typical Sunday morning? What did you do last Sunday? Most of Bangalore’s population or what seemed like it, has decided to get on a bicycle and ride at the Vodafone Cycling Marathon. Before you wonder, ‘Cycling Marathon’! ?, let me tell you that whoever named it as such won’t getting any marks for originality, at least from me. The organizers do get good marks however for setting up a cycling event of a massive scale, matching some of the best running events around, at least in scale. The event is setup to start from Sree Kanteerava Stadium. The route is a ~4.4km loop that goes around the Kanteerava stadium and a part of Kasturba road which diverts on to the Queens road running alongside the Chinnaswamy cricket stadium. The loop was advertised as a 5km loop and four different categories of rides have been designed around it. The event started with a 40km ‘Passion Ride’ which was to take a 8 repeats of the route loop. This was followed by 60km ‘Champion Ride’ which was for registered CFI(Cycling Federation of India) cyclists, where the best of the riders from India took part. Then came the 20km ‘Green Ride’ and 10km ‘Fun Ride’ for beginners. There has been much publicity around the event, and it showed. There was a sea of riders going round and round near the Kanteerava stadium at 7am when I made my way there to participate in the 60km champion race. I waited for 5-10 mins to see if there will be any gap in the flow of riders so that I can cross the road and make my way to the start point but to no avail. The stream of riders for the 40km passion ride was continuous and showed no signs of ebbing. I figured the best way is to join them and ride to the start point along with them. I was riding slowly with an ear to ear smile plastered on my face seeing so many people riding. I was suddenly jolted into alertness by an ear piercing siren which turned out to be of the lead vehicle of the front runners of the 40km ‘race’. I thought to make an event of so many participants into a race wasn’t the smartest move from the organizers. With about 1500-2000 riders of various abilities riding on a 4.4km loop, it was inevitable that the faster riders will run into a traffic of the slower riders from the second loop onwards, resulting in mayhem on narrow sections of the route. That was exactly what happened and along with the sirens of the lead motorbikes, the lead riders themselves were shouting at the top of their voices for the slower riders to get to the side to avoid crashing into them while keeping the speed up. I thought it was dangerous to ‘race’ in such circumstances both for the slower riders and the faster folk. Ironically, the ambulance which was supposed to provide medical help almost caused a crash or two by continuously doing rounds on the route as if the rider traffic wasn’t mad enough. On one of the laps, it actually split the lead pack right into half by driving right through the peleton resulting in some of the riders losing momentum and position in the pack. Adithya Kaul of Team ProCycle was one of it’s victims who fortunately avoided crashing. But there were a fair share of crashes as can be expected with so many riders who probably never rode in a group larger than one, suddenly riding in a group of thousands of riders in a cramped road. Despite the little glitches, most of the riders of the passion ride had a ball. For a lot of them it was probably their longest ride and possibly their fastest. The very fact that we got to ride on closed roads in the heart of the city in the company of so many cyclists was enough to make a lot of the riders feel like they were in paradise. The passion ride/race was won by Basavaraj Birappa Kadapatti (Team Wheelsports). 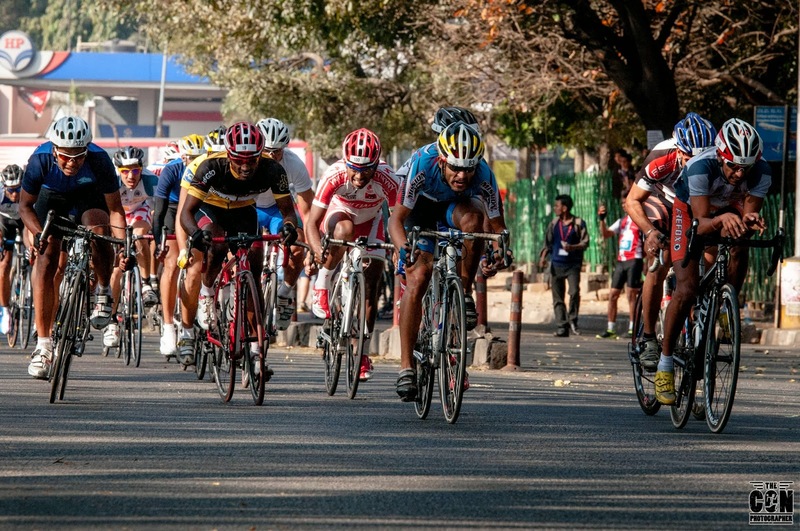 Siddarth Kansal finished 2nd in the final sprint while another duo from Wheelsports, Sadashiv Malappa Kadapatti and Gajanand Mahadev finished third and fourth respectively. The youngster from team SFS, Praveen Kumar finished 5th in the final sprint. You can check your ride timings here. Champion Ride/Race: Race They Did! After the ‘Passion ride’ finished 100 odd CFI registered cyclists made it to the start line. The huge prize money of INR 2.5lakhs for the first prize and around total 20lakhs worth of prize money for the top 20 meant, it attracted some of the very best cyclists from all over India. A very few amateur riders who wanted to be part of the event to get some race experience while avoiding racing among thousands of riders, managed to get CFI licenses at the last moment and made it to the start line of the 60km race. Our skipper, Dr. Arvind Bhateja and I, from Spectrum Racing, fall into that category of outsiders in the champion race. Although it was advertised as 60km road race, with the race being conducted on a 4.4km route with 12 repeats of the loop, it made sense for the organizers to make it into a proper Criterium race with sprint points and prime laps. That is what they announced at the start line. Every alternate lap would be a sprint lap awarding points with the first rider getting 5 points, 2nd rider 3 points, 3rd rider 2 points while the 4th rider gets 1 point. With 12 laps there were going to be 6 sprint laps. The rider who accumulated the most points wins the race. The riders who get lapped by the lead bunch get out of the race. Criterium is a great spectator race with the pack of riders going round and round multiple times and the regular sprint action makes things all the more interesting. That also means the group wont be riding relatively easy for most of the race before unleashing the winning tactics towards the business end of the race which is very usual in a mass start road race. So, my plan of hanging on to the lead pack as long as possible and finishing the race without crashing quickly got shelved. With aggressive riding likely, right from the start and throughout, hanging onto wheels of some of the best riders in the country is going to need a lot more power and skill than I have right now. So, the new target has become trying to hang onto them as long as possible and to prolong being lapped as long as possible once I get dropped. Riding without crashing was still the main agenda item. As the first lap got underway, I thought the pace was quick although it was supposed to be a neutral lap enabling everyone to get a good feel of the route. But I was wrong and the pace picked up on the second lap and the peleton was going at about 43kmph average for the second lap. That with a bit slowing down to tackle the various sharp turns including one U-turn with really sketchy road. The actual pace after the turns was much higher. Trying to hang onto the bunch at the end in such scenarios is one of the most difficult things one could do. The rubber band effect just makes the things that much more difficult when the lead pack accelerates after making each turn. The cumulative effect of such accelerations quickly gets to you and the chances of losing the pack multiply with every lap. After hanging onto the bunch for two laps, my time was up halfway into the third lap where I got dropped on the slight incline leading up to the U-turn. Once dropped, it was impossible to try and get back. With SKCT’s team director and support crew Vivek Radhakrishnan shouting encouragement, urging me not to give up and to try and bridge the gap before the bunch got to the U-turn, I tried desperately to make up the lost ground. My heart rate was well over the red line and I came within a few meters to the bunch at the U-turn. But once the bunch made the turn it accelerated again and it was gone by the time I got into the turn. It was game over for me. I have decided that I’ll keep going in time trial mode and see how long I can last before the lead bunch catches me from behind. My new target became to last at least 10 laps which means I would get a little over one hour of solid workout making the outing all the more worthwhile. The vociferous cheering from the friends on the sidelines on the route shouting my name every time I went past them was just the adrenaline shot I needed as I kept pushing alone. I kept going past others who were dropped by the bunch and those who gave up and stopped by the sidelines. I was surprised to see so many riders giving up. I was hoping some who kept riding including my skipper, Arvind, would join me while I overtook them so that we could work together. But that didn’t happen. I kept seeing Kiran Kumar Raju about 200 meters ahead of me riding with another rider. They were working together taking turns at the front. I wanted to bridge up and join them. I tried going faster but the gap remained constant as the laps kept ticking by. The gap between the lead bunch and myself kept increasing with every passing lap. Which meant that they were gaining on me and approaching closer to me from behind with every lap. I kept churning the bigger gears as much as I can but eventually after I made the U-turn on the 8th lap, around 54 mins into the race, the lead pack lead by Sachin Panwar of Team Trek Firefox ate me up. I followed them to the start where I ended my race. I was happy I got a good workout and was able to watch some of the best cyclists in India race. After my race ended the lead pack had 3 more laps to go and I got to watch them sprint up-close from the starting area. If we thought the pace of the pack was already crazy we got to see what the sprint speeds were as they approached the start/finish/sprint line. As the riders made the turn from Rajaram mohan roy road and get on to Kasturba road, they would cross the timing mats and line up to the straight stretch towards the sprint line. That is when the pace and the action used to pick up and go berserk with riders jostling for positions, lining up and winding up for a high voltage sprint to the line. Sreedhar Savanur of Team Wheelsports has already raked up quite a few points by winning the sprints in most of the prime laps. By the 10th lap which was the fifth and penultimate sprint lap, he already raked up a 6 point advantage over his closest rival C Rajesh of Tamilnadu. That meant his lead was unassailable since even if Rajesh or someone else wins the final sprint, and Sreedhar doesn’t get any points, he would still be ahead of the points race by at least one point. Sreedhar finished the final sprint 3rd and won the points race by a margin of 4 points with a final tally of 21 points. C Rajesh finished 2nd with a final tally of 17points while Amarjeet Singh of Punjab finished 3rd with 10points. Satbir Singh finished 4th. The top 20 finishers of the race were awarded cash prize. It was surprising to see none of the riders from Specialized KYNKYNY Cycling Team or Team Trek Firefox Racing in the top 5 in a more representative field. Update: SKCT skipper, our beloved Loki(Lokesh Narasimhachar) apparently finished 5th. How Green And Fun Was Your Ride? The Champion ride was followed by 20km ‘Green Ride’ and that was to be followed by the 10km ‘Fun Ride’. I had to head home halfway through the Green Ride but what I saw as I made my way out was appalling to say the least. The traffic was being allowed on the ride route and riders were being stopped to let the traffic through. I am pretty sure it wasn’t 12:45pm when the event was supposed to end. So, I was perplexed at the fact the route hasn’t remained closed for traffic. There was sea of riders for both passion ride(40km) and Green ride(20km). This was from Green Ride! In fact even when the champion race was going on there were cars coming on to the race route and pedestrians crossing casually into the line of the racing riders. I thought the marshals and police responsible on the route were quite lax. I almost crashed into a pedestrian crossing the road on two occasions in the race and escaped a car coming out of the petrol pump and onto the race route which almost side swiped me while I was suffering, racing at 40kmph. Others in the champion race have had similarly scary experiences but thankfully no real accidents happened only because of the riders managed to stay alert even while racing at those speeds. So, with the traffic being allowed to come onto the ride route, many of the riders in the Green Ride were understandably flummoxed. There were reports of more crashes from the riders on the event page. The Green Ride was apparently cut short for many riders although they were still within the stipulated time. The Fun Ride apparently was cut even shorter and the riders were made to just go around the Kanteerava stadium. It is no wonder that most of them felt cheated of their ride. It seems like the organizers have got the scheduling wrong and/or were not clear with the Bangalore Traffic Police when the asked for closed roads for the event about how long they needed the roads to be closed. Granted that it was a great start and that cycling needed an event of this magnitude to spread awareness and get more people to get out and ride. To large part the riders from Passion Ride(40km) and Champion Ride(60km) had a positive experience barring minor issues pointed above. But it seems things got downhill from there when the thousands of riders consisting of riders as young as 2years old and as old as 70yrs who registered and turned up for Green Ride(20km) and Fun Ride(10km) were subjected to neglect and were risked into open traffic. That should never have been the case. Cycling doesn’t need the negative vibes that these riders might have carried back from the event. It needs the positive vibes and good memories that most of the riders of Passion ride and Champion ride took back with them. Hopefully the organizers will take the feedback they have been receiving and will do a better job of it next time. Photos in this post were taken from High on Marathon, Vish Photography, The Con Photographer. Check out other super photos from them by clicking on those links that take you to their albums. Photos from my phone are here.